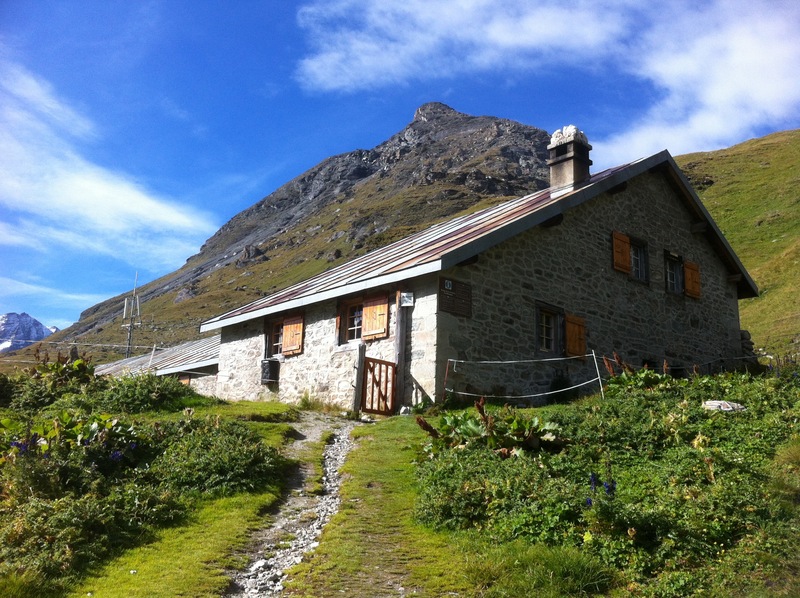 We decided to take an alternative route and stay at the Cabane des Dix instead of going all the way to Arolla today. That would make today’s hike shorter than originally planned. Sano wanted to stay up in the mountains instead of going down to the valley. It turned out to be a great decision…. 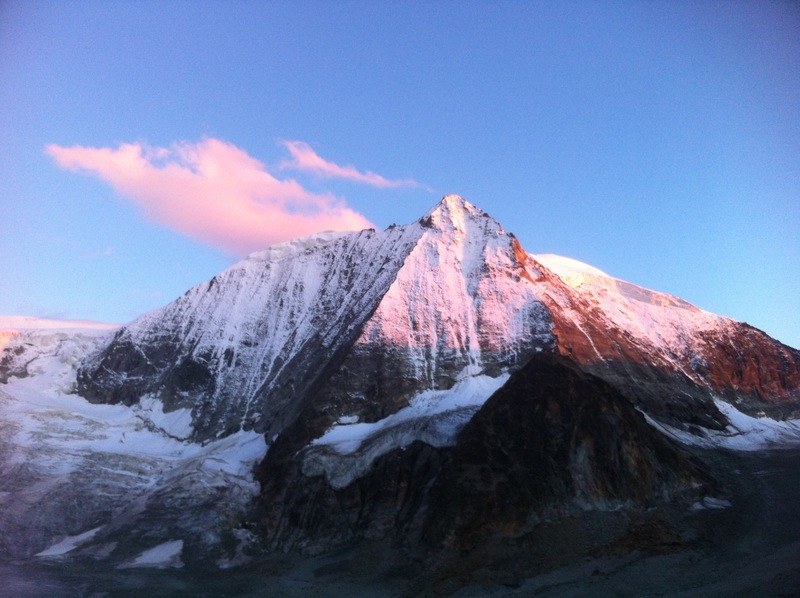 The first col to overcome today was 200m above our hut. As our route was shorter than others, we took it easy and waited for others to go up first. We could see our co-hikers braving up the steep slope early in the morning. 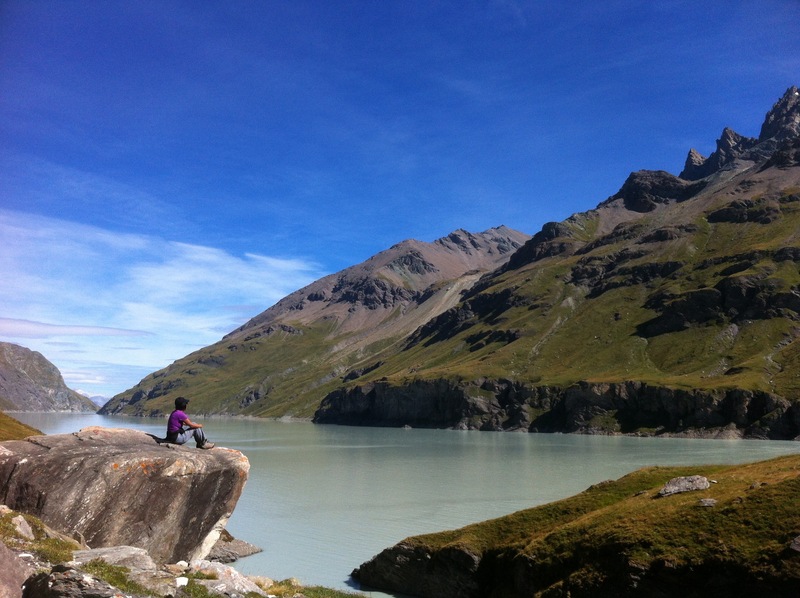 The moment we were up, the Lac des Dix opened up in front of us. The sunlight had not yet reached the surface of the water. The lake was dark-blue and still like mirror. There was no one except a man in his 70s who sat alone on a rock, overlooking the lake. I started talking to him as usual (it is easy to talk to people in the mountains) and he turned out to be from Lausanne where I used to live for almost 10 years. He is a passionate hiker and he said he comes to the mountains roughly 90 times a year! “The mountains are like a drug for me,”, he laughed. Instantly I got to like him and we chatted for a while, admiring the splendid view together. As he was waiting for the sun to illuminate the lake and we still had a long way to go, we said good-bye and moved on. When we came down to the lake, we heard him calling out, looked back and waved at him. We could clearly see him against the blue sky waiving back. What a beautiful encounter I had with a stranger, and what a beautiful moment I shared with him! The trail was on the grassy land. While enjoying the view of the lake and pointy peaks across the water, we arrived at the beautiful Refuge de Barma, as the Swiss hiker mentioned. This refuge was un-manned but it was clean and spacious, well equipped for cooking. The hut had nice tables and a lake-view bench for picnic. A great spot to enjoy snacks and the warmth of the sun. We continued on the wide, easy path to the pretty much at the end of this lake. From there a steep climb started on the moraine. 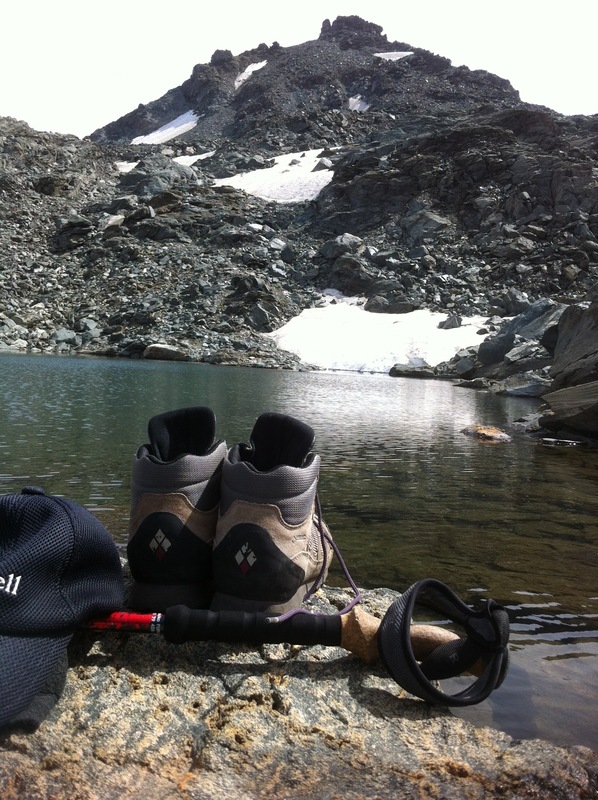 Soon the trail forked into two: one to Arolla and the other to Lac des Dix, written in red paint on the rock. We scrambled on the tiring trail, stopped many times to regain forces. On the top of the moraine called Tête Noir (“Black Head”), Dent Blanche (=”White Tooth”) and Matterhorn were far away, but clearly seen. It was three valleys away from here. Still a long way to go to our last destination, Zermatt. … so I woke up with apprehension. Three times up and down is on today’s mountain menu. In the middle of breakfast we heard other hikers’ “ohh” and “ahh”. 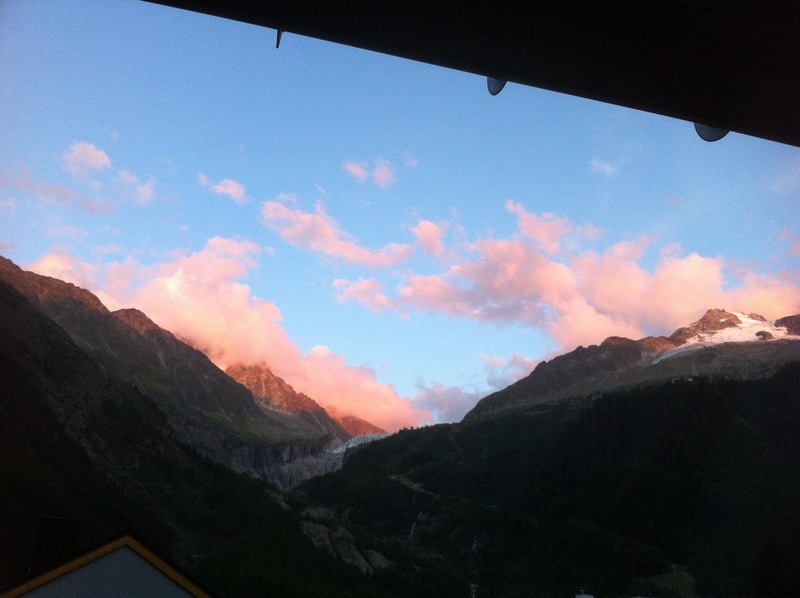 When I looked out of the window, the sun started illuminating the distant Mont Blanc. We all hurried outside with cameras. The air was still cold but the sky was clear. The snow on the Mont Blanc was glowing in pink. After thanking Daniel, a shy but very competent guardian of the hut, Sano and I put on our backpacks and walked into the fresh morning air. Almost everybody seemed to be heading for the same route. 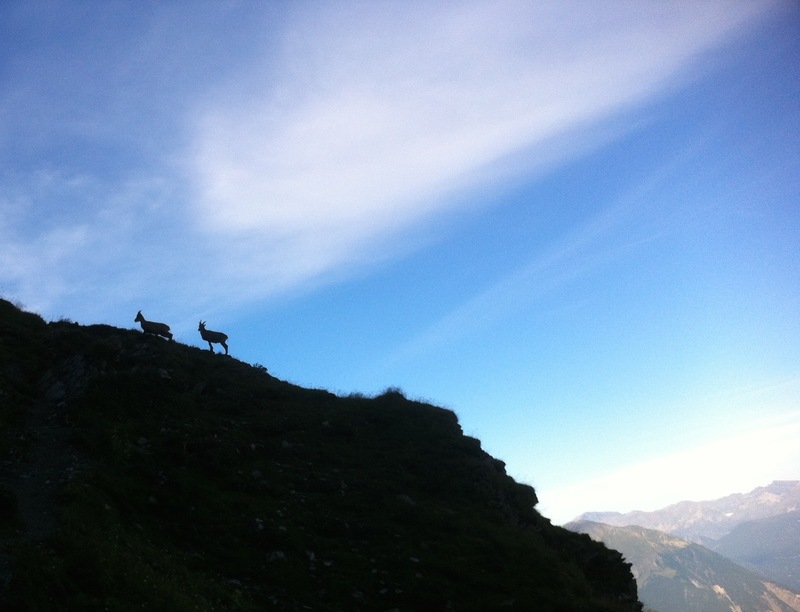 While we were traversing the steep slope on a narrow path, 6 or 7 chamois appeared on the ridge above. The silhouette of their slender body contrasted against the blue sky. What a beautiful sight! They looked at us for a while and then ran away higher up. We kept traversing the slope as if we were heading direct into the massive snow-covered Combin, which soars aloof across the valley. 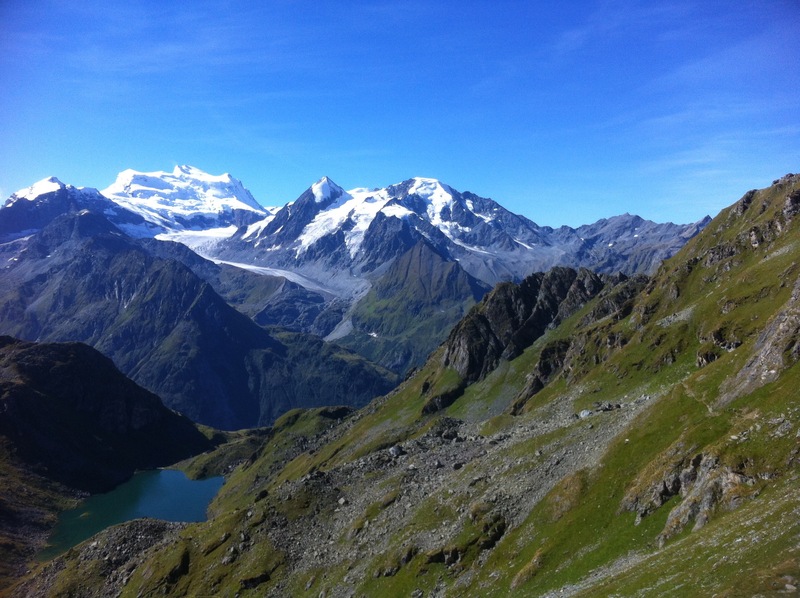 The Grand Combin (4314m) is so dominant that we could not keep our eyes off! However, the trail was narrow and it required our full attention! On our right, the valley was just about 1000m down a pretty steep slope. 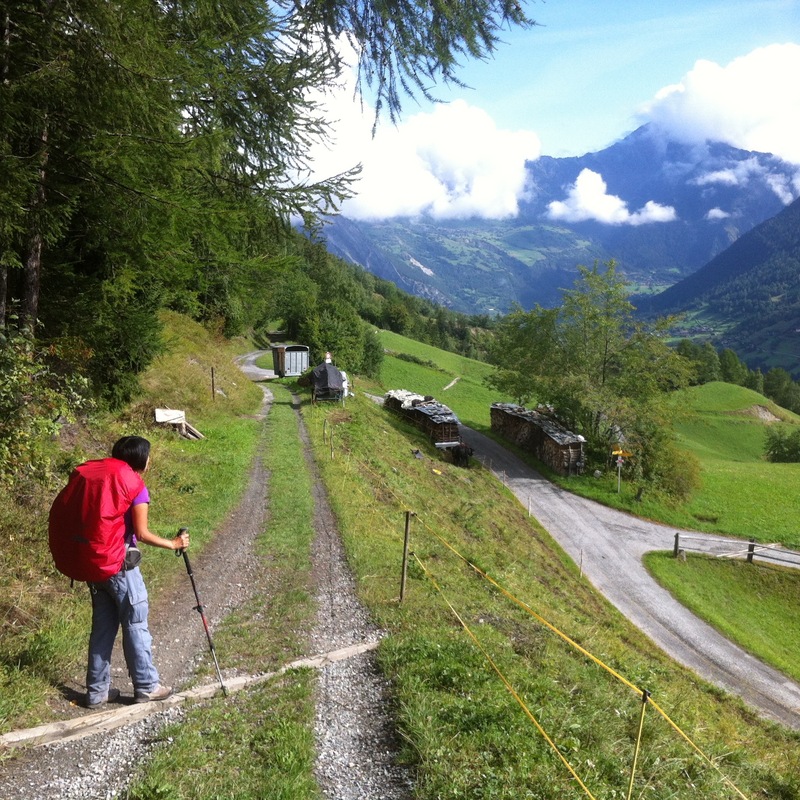 Many hikers were also coming from the opposite direction which creates a pleasant form of alpin crossroad congestion. A friendly hello, may be a quick chat and everybody was on the way again. 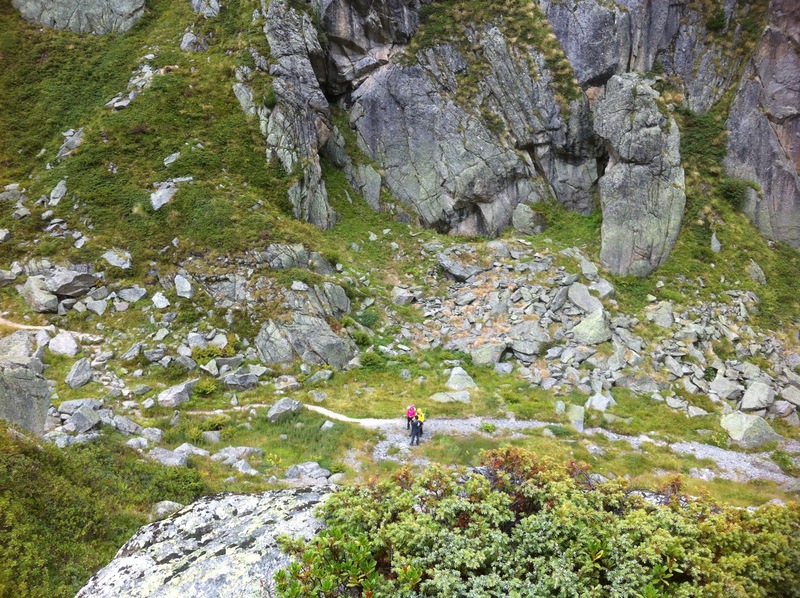 In two hours we arrived at the first pass, the Col Termin (2648m). 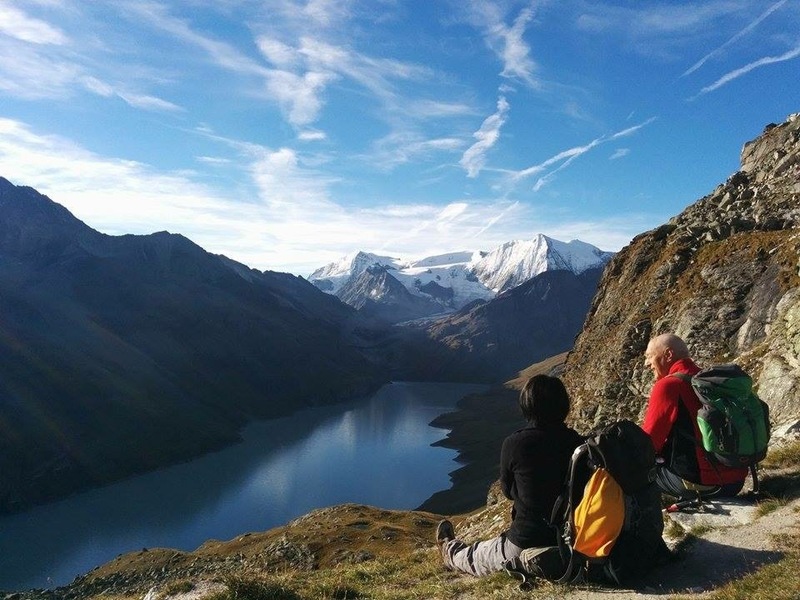 It was a fabulous viewpoint, facing the Grand Combin in the south and looking down at Lac de Louvie (Lake Louvie). Along with other hikers, we had a short break, enjoying the splendid view. Our spirits were high after such an incredibly scenic trail, but from there a steep downhill was waiting, before climbing up to the 2nd pass. 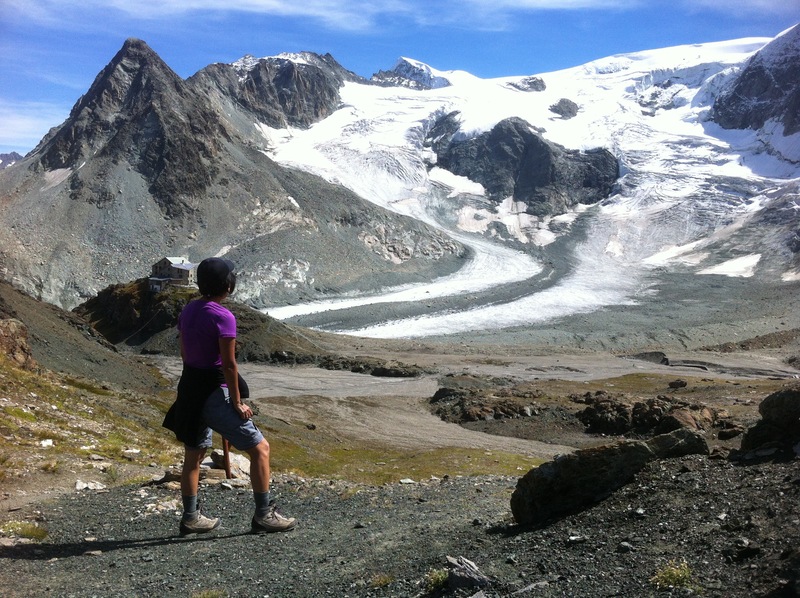 After managing the valley of stones and rocks, we arrived at the Col de Louvie (2921m). We were happy to stop and settle for our last dry-freeze Japanese rice lunch. The American team (five people from the Massachusetts hiking club) was nearby and in their usual upbeat mood. John was brewing coffee and looking over to us said: “Starbucks open!”. From there we looked down a wide, barren moon-like landscape, which is called The Grand Désert, and marched down the rocky trail. As soon as I saw a small glacier pond, I could not resist the temptation to take off my shoes and socks, and soak my tired feet in the cold water. Refreshing but so cold that I could not keep them under the water more than a few seconds! Karen and John from the Starbucks team joined me in soaking their feet for more than a minute. Different breed – or may be their feet were just about to fall off. After we passed what we believed to be the 3rd pass, which it was not, the real 3rd pass appeared on the horizon! Incredulously I gazed at this pass which looked steep and far away. I was not prepared for this and really exhausted after all these ups and downs on slippery gravel slopes which required a lot of attention and physical effort. But no choice! Complaining silently to myself, even questioning why I do this, I climbed the exhausting path of rocks and screes to the 3rd col, Col de Prafleuri. Finally the hut came into view. 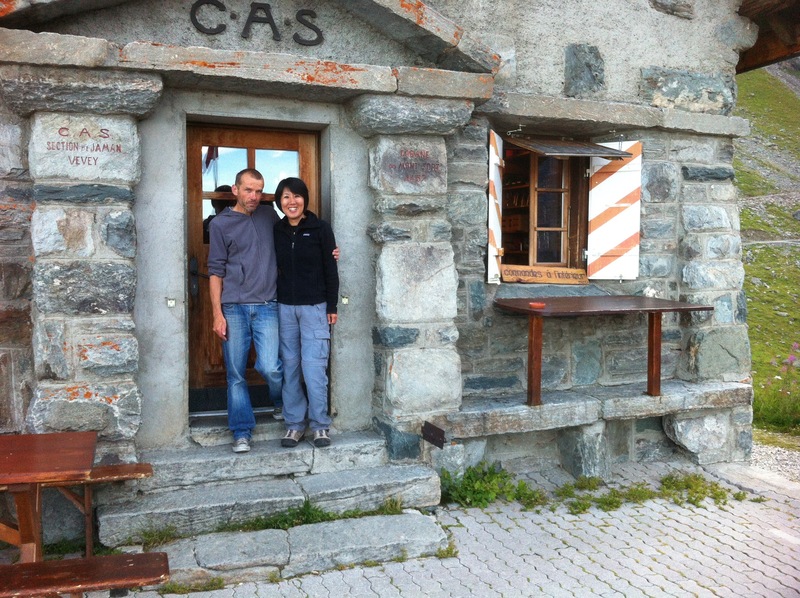 I was relieved when I arrived at the Cabane de Prafleuri. We were almost the last ones and the terrace was already buzzing with many other hikers. The hut was located in the middle of an eerie, barren field, locked in by the treeless mountains. It almost looked like some kind of construction site, without any open view. Beautiful? Not really. Sano was in the meantime euphoric after today’s hike, while I was glad that I could finally put my feet up. After 50 hikers negotiating two showers and two toilets, we sat at the dinner table chatting with a friendly UK team (two sisters and their husbands). So early in the morning we were already up above 2000m without any sweat. From the cableway end station we started walking to the Cabane du Mont Fort. 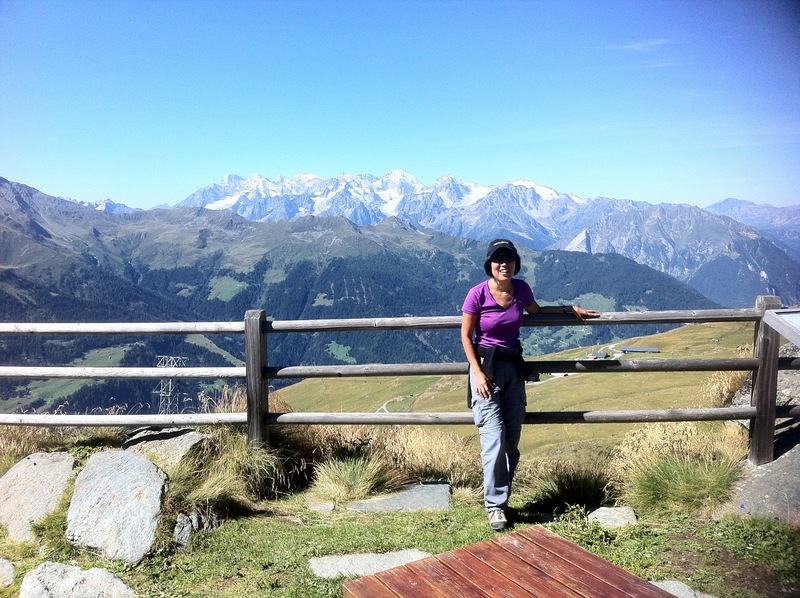 Verbier is a famous ski resort (apparently popular with British tourists) so many ski lifts are here and there. This in general disturbs the scenery, nevertheless the view from there is outstanding. 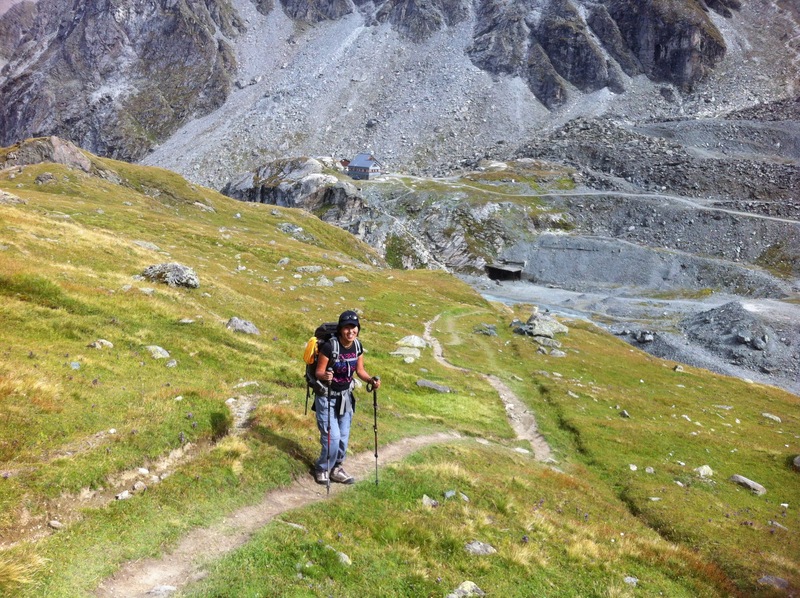 Arriving at the Cabane du Mont Fort (2457m) around 10 am, of course, we saw Haute Route hikers nowhere yet. 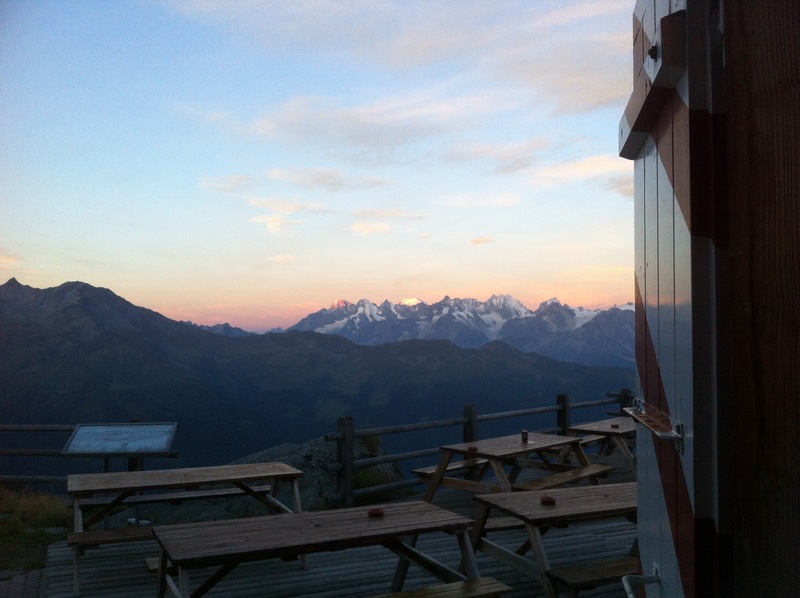 On the sunny terrace of the hut, four local elderly Swiss men were enjoying the scenery over coffee. A great place to get together with friends! 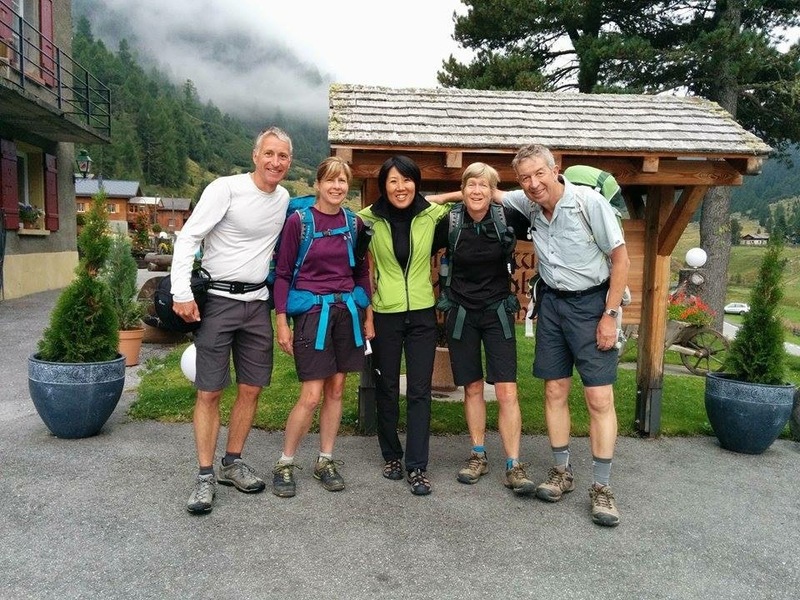 Some of them seem to be around my father’s age – I always admire these fit Swiss people. 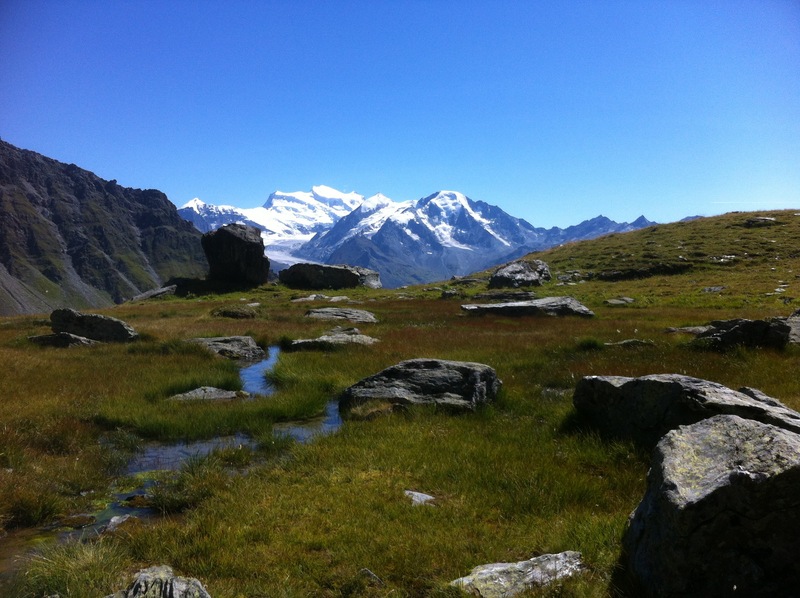 The view from the Cabane – priceless! A panoramic view from the snow-covered expansive Combin Massif to the Mont Blanc range with the Trient Glacier, and even the Dents du Midi. All these mountains at one go! On the way back in the middle of beautiful moor-like meadows we found a great spot, a large rock in the sun. We sat on it, basking in the warmth of the sun and talking. It was still early in the afternoon and we did not need to go back to the hut yet. Nothing to hurry to. Just enjoy the moment, the scenery and the company. Great life! I have not been to a mountain hut for a long time (Philippe finds it a horror to stay there) and did not expect much about food at the hut. However, the dinner at the Cabane du Mont Fort was fantastic: salad, pasta with accompanying vegetable and dessert. Plenty of food for hungry hikers and very delicious. It seems that only two men were cooking and serving over 40 people flawlessly! Blue sky after two rainy days! 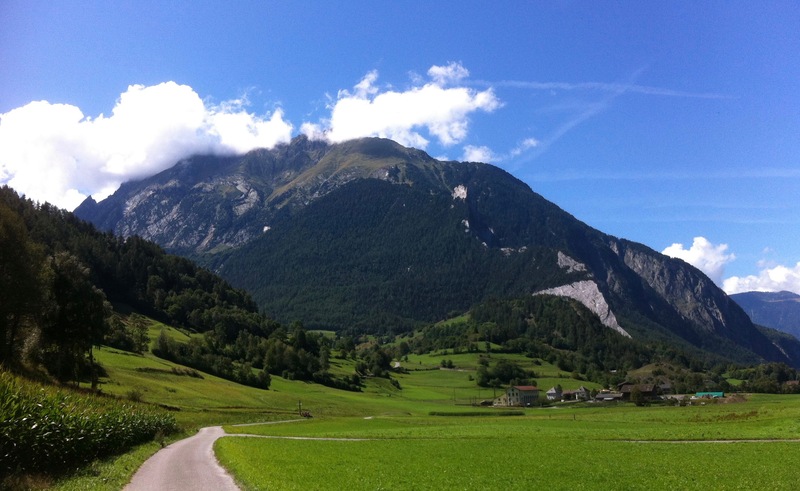 Today is an easy day – downhill only : ) From just behind our cozy Hotel Splendide, we started going down the valley, the Val d’Entremont, passing small farming villages and the vividly green pastureland. Nothing but peaceful Swiss countryside. After a couple of hours we arrived at Sembrancher which is located pretty much at the bottom of the valley. A charming village with a cobbled-stone square and a church. Going through the village and admiring charming old wooden houses, we looked for a good spot for lunch. After lunch we continued on the trail in the forest and along the river. Finally a tall church appeared still far away. It was today’s final destination, Le Châble. 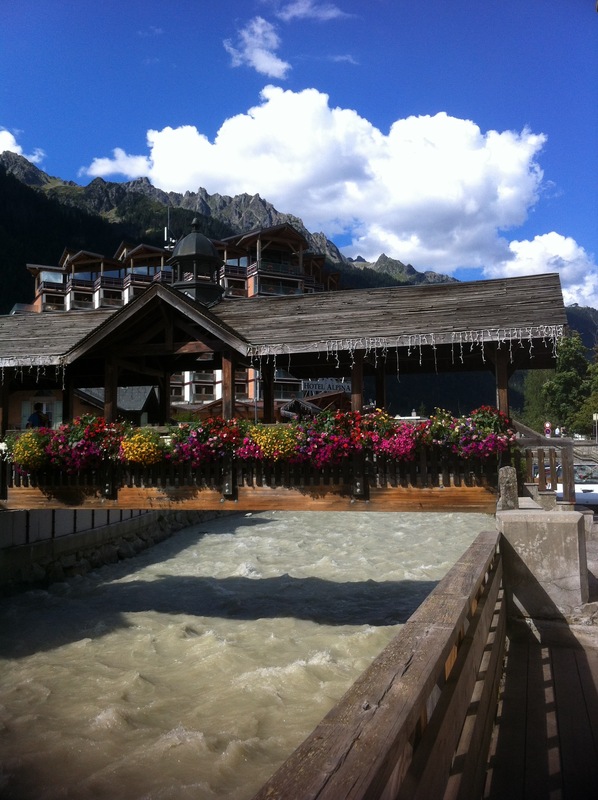 This good-size town is situated at the bottom of a famous ski resort called Verbier, sandwiching the river, La Dranse. After our usual chores of laundry and food shopping, we had an important mission today: make our backpack light! 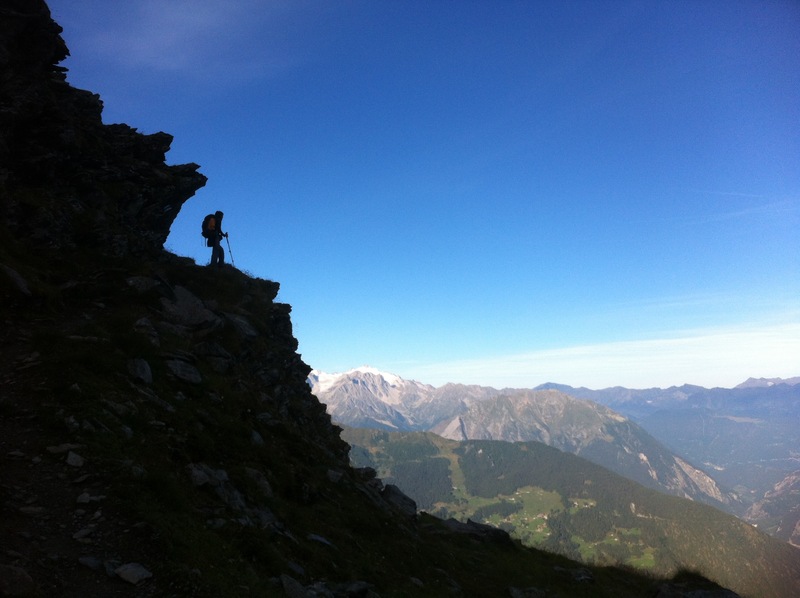 We were inspired by a light backpack of our Haute Route co-hiker Jean from Scotland. 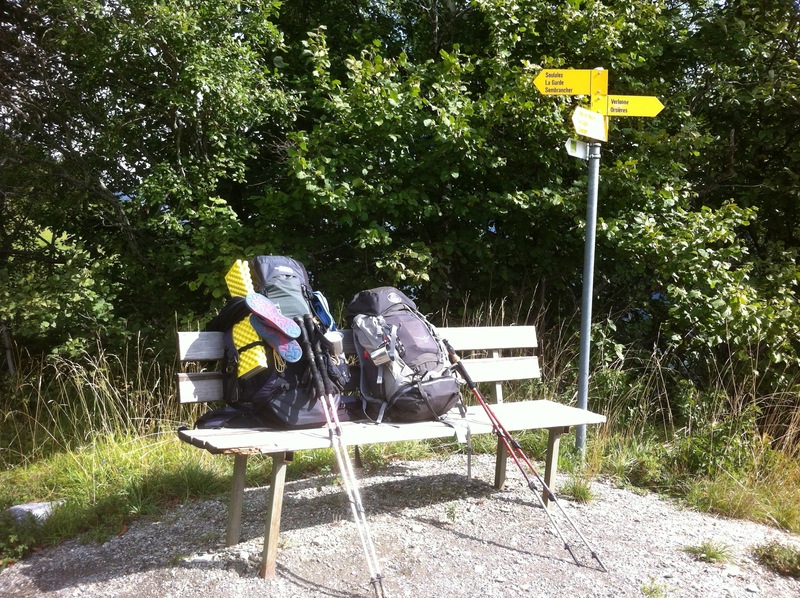 We suffered from our heavy backpacks and our aim was to reduce our stuff to the strict minimum. Everything was under our strict review; Sano’s Jetboil (convenient for cooking but heavy) was out, my binoculars (good to have but heavy) were also out, with other clothes and many more small items. To minimise our food weight, we decided to eat main meals at the mountain huts or hotels so we carry only snacks and water. We went to the post office next door, bought the biggest parcel box and sent out all the items to my home in Meilen. We felt happily lightened! Ready to fly to new heights. We got up at 6am. 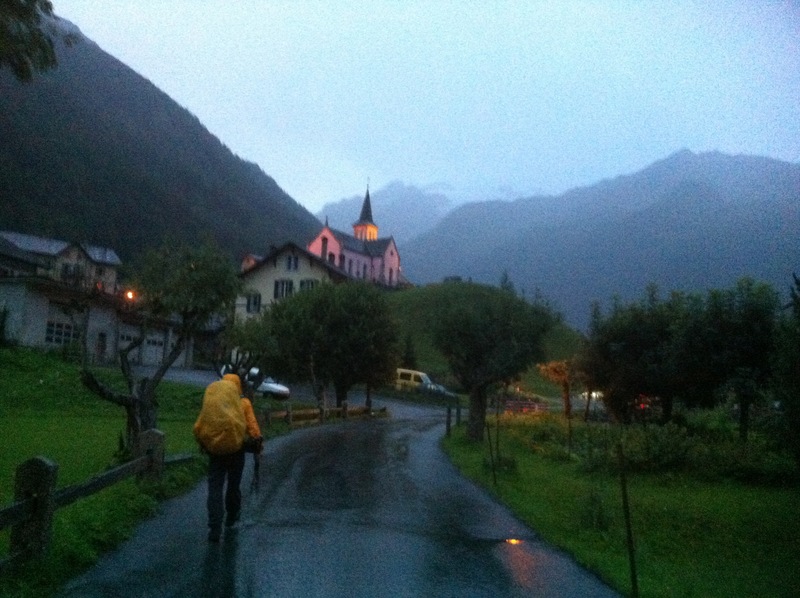 it was dark and raining outside : ( We left the hotel in the full rain gear for the bus stop. While waiting for the 6:50 am bus, we continued to debate our route today. The original route via the Fenêtre d’Arpette was already out of the window: a thunderstorm warning made climbing the exposed path not safe. 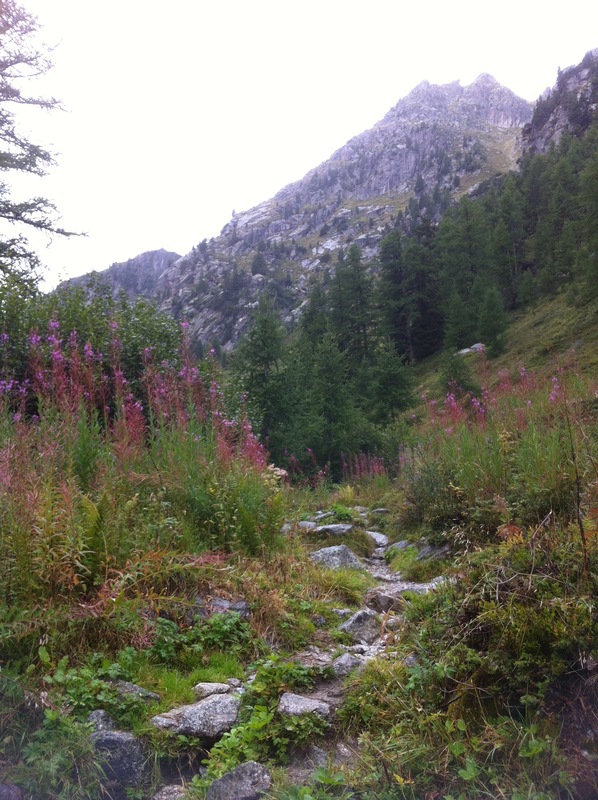 The prospect of hiking up 1000m on the alternative route of Alp Bovine in the rain did not seem funny neither. When the bus arrived, we finally made an executive decision: scratch out today’s hike and take a bus all the way to Champex via Martigy. It was a big decision and we felt a bit sheepish about it. But Sano and I had one point in common: we love hiking but it has to be fun. Hiking in the rain is not included in our definition of “fun”. While three hikers got off at the Col de la Forclaz braving into the rain, we continued on the bus, staying nicely dry and looking out the view of the valley (still dark in the beginning), till Marigny and changed buses to Champex. In Champex, after a friendly receptionist at the Hotel Splendide kindly let us check into a cozy room, we decided to visit the Champex Lake. This small, usually pleasant resort town Champex had a somewhat gloomy feel to it under the heavy clouds and the lake was reflecting the dark sky. Energised by a plum cake and hot tea in a local coffee shop, however, we felt better and headed for the Bisse du Petit Ruisseau. 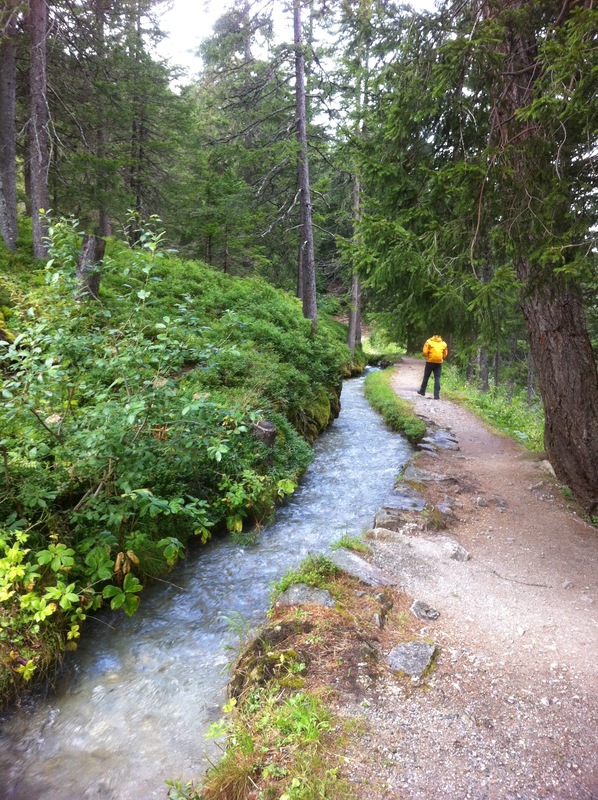 The “Bisse” is a watercourse and a famous irrigation system in the Valais region. The footpath continued upward along the beautiful stream and to the direction of the Val d’Arpette, which was supposed to be our original hiking route. Though the menacing clouds were out there, we thought we would keep going and turn around if it starts raining. After passing a mountain hut, Relais d’Arpette (1627m), the pasture dotted with a couple of farmhouses continued for a short time and then we started climbing up among rocks and boulder. Once we climbed up to the high boulder for a view, we could see the path from the top of Arpette far away. We gazed at soaring rocky peaks in the fast-moving mist. The valley of Arpette war beautifully wild and lonesome. By that time we saw two hikers coming down. 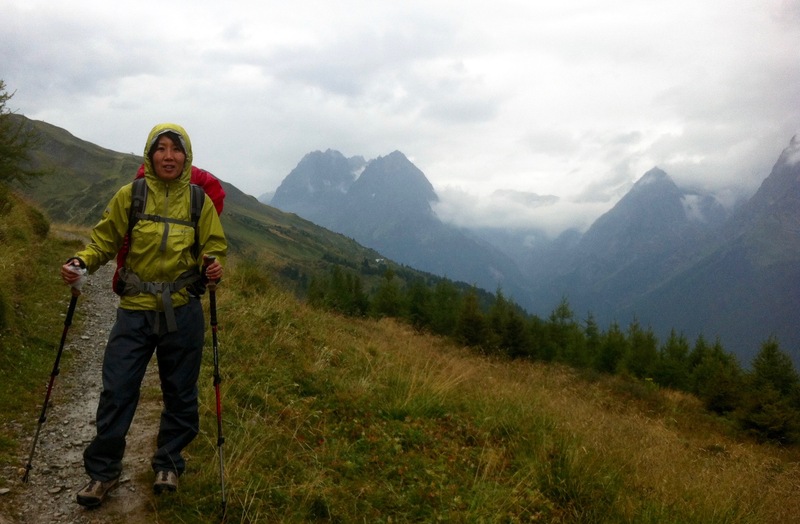 We chatted and found out that they braved through the Fenetre d’Arpette path despite the thunderstorm warning! We were further surprised to know they had a reasonable view from the top!! We were disappointed that we chickend out. It really looked marvellous and also manageable, but how could we know about the weather? Oh well, I have to come back here one day…. A bus driver kindly gave us a free ride to Le Tour and from there we hopped on the tele-cabin. It was not exactly cheap (€22 per person) but it was worth it. We could see other hikers walking up and felt a bit sheepish. Yesterday we lost a bit of confidence in climbing up 1000m with our heavy backpacks : ( In any case, we had to go down another 1000m to the other side of the valley to Switzerland. Once we went up to the Col de Balme (2204m), the sun showed its friendly face for a moment reflecting on the Mont Blanc mountain range. It was magical. Despite the cold we hanged out there for a while, admiring the mountains, taking photos and talking about potential future hiking routes in the Chamonix area. An endless topic. Finally, we started heading for the Col de Balme passing the mountain hut. From there our path was going straight down. Sano suggested that we go left around Tête de Balme instead and I jumped at his idea right away. The weather did not look favorable and it would take more time, but seemed more interesting than to just walk down to Trient. Soon it started raining, our complete rain gear got its first show. In the heavy mist we could still see the Lac d’Emosson and the valley dropping into the abyss (kind of), which we saw from the train yesterday. It was scenic with a mysterious-feel to it. On the way we only met a couple of people, French hikers and two more. After a while the rain stopped and we started serious downhill. Once we went down to Trient, we headed for our hotel, La Grande Ourse. While we were drying our rain gear outside, two Japanese hikers and their two guides came out after lunch and we started chatting. 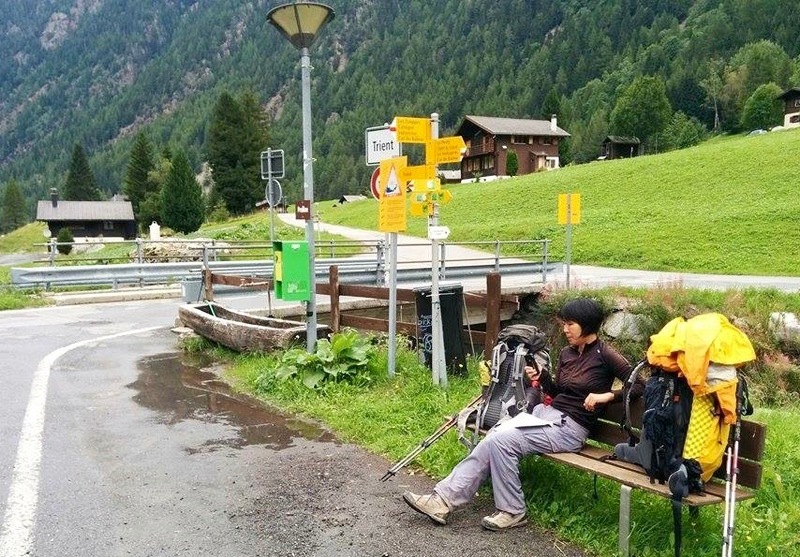 These older Japanese women were also doing the Haute Route, but in a short and luxurious version, escorted by the guides and a car for hard parts. 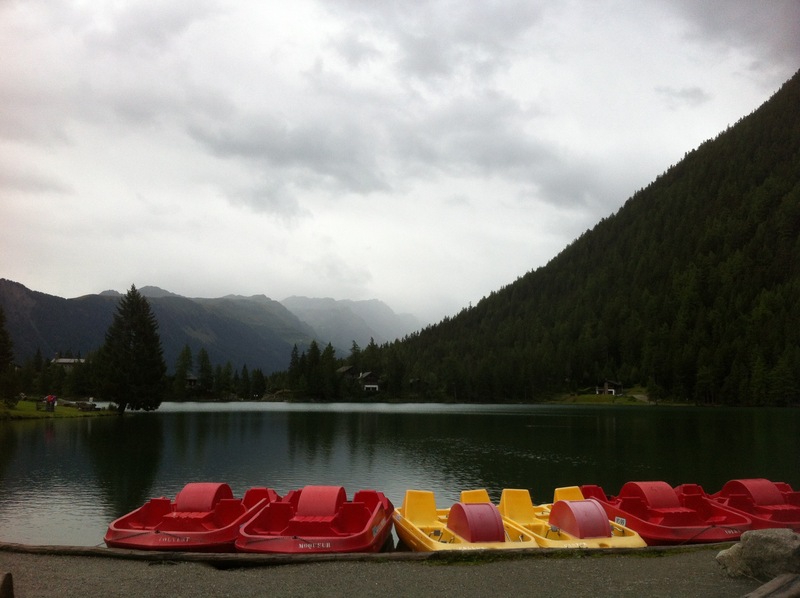 They were skipping 3 stages and going directly to Lac des Dix afterwards. 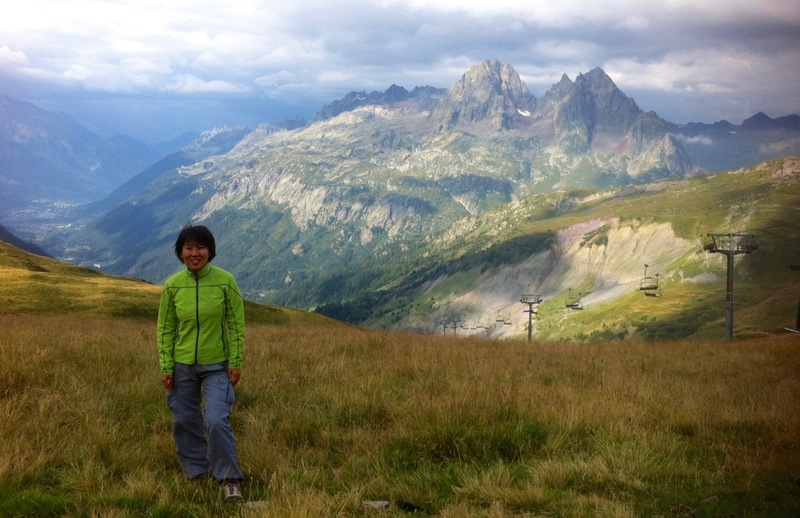 The Japanese guide who is based in Chamonix told us that we had better not take the Fenetre d’Arpette tomorrow, if there is a thunderstorm warning. 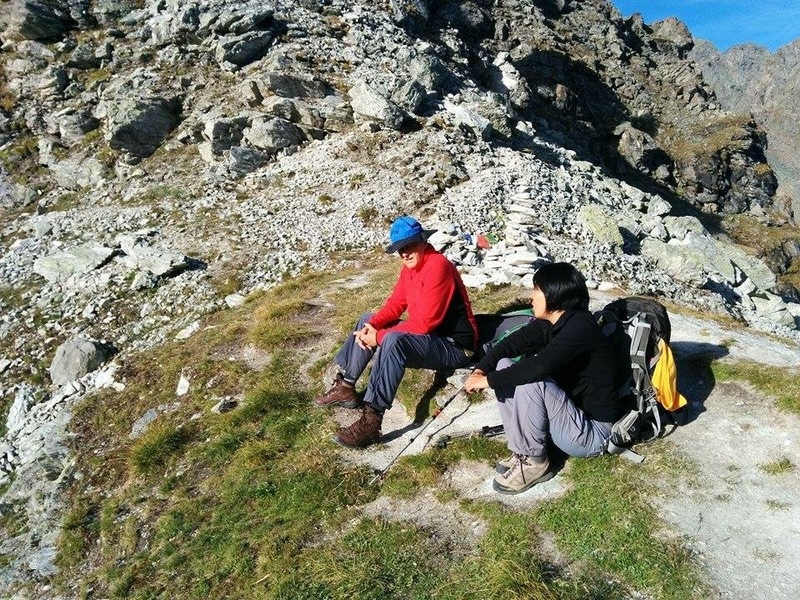 He told us that one Japanese hiker was seriously injured recently and helicoptered out from the Arpette path. Now he had me worried. Sano and I intensively debated tomorrow’s hiking route over late lunch on the terrace. 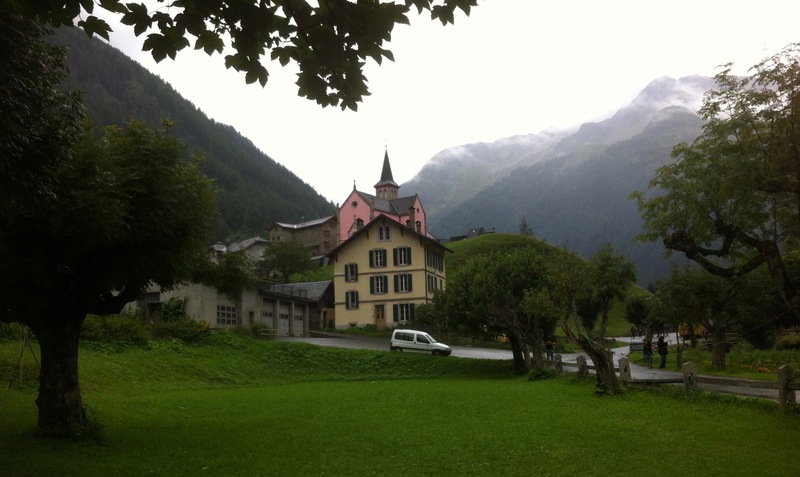 In the meantime, more and more hikers in wet rain gear were arriving a the hotel, with a couple of big groups which seem to be doing the Tour de Mont Blanc (TMB). The first two or three days of our route are overlapping with the TMB so there were a lot of people in this small village of Trient where only two hotel/dormitories exist! By the dinner time, the hotel was completely packed with hikers. After dinner I walked around this small village. Trient is a quiet and sleepy village but somehow charming. Departing from Zurich for the starting point Chamonix, France. It was a sunny day and we left by train gazing at the fabulous view above Lac Leman (Lake Geneva). More dramatic views are hard to find even in this beautiful Switzerland. The vineyards hit the shore of the lake, while the French alps soar on the other side of the lake. Wow. On the InterCity from Lausanne to Martigny, we chatted away with a friendly Swiss flight attendant from the region. In Martigny we changed to the Mont Blanc Express and this cute red train climbed up to the narrow Chamonix Valley, which is so steep and deep that we could not see the bottom from the train. 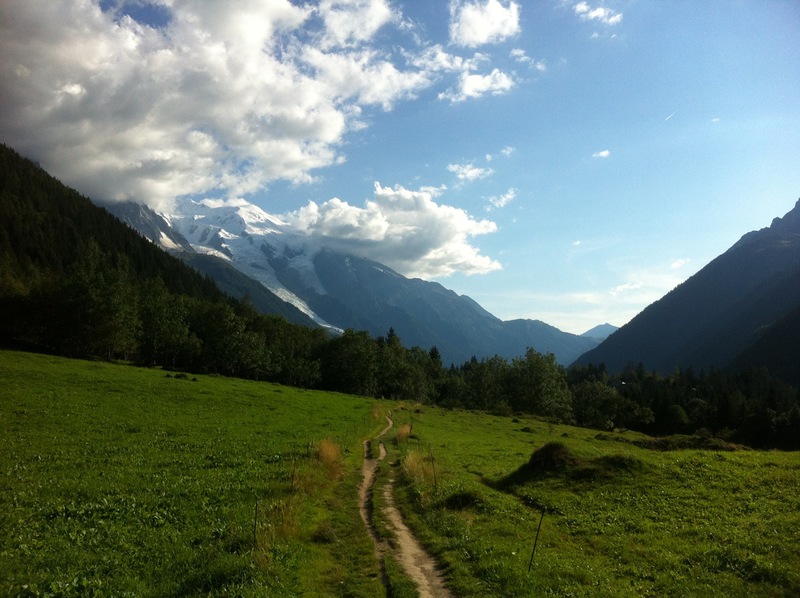 In Chamonix we were lucky to be welcomed by a clear view of Mont Blanc! The snow of the mountain was shining under the sun and the town was teeming with tourists. We quickly gave up the idea of getting up to the Aiguille de Midi after being told that it would be a 2-hour wait. But we saw another tele-cabin going up to the other side, Le Brévent, and Sano-san hopped on to have a 360-degree view from the Le Brévent side of the valley. His excitement was contagious. A great start! 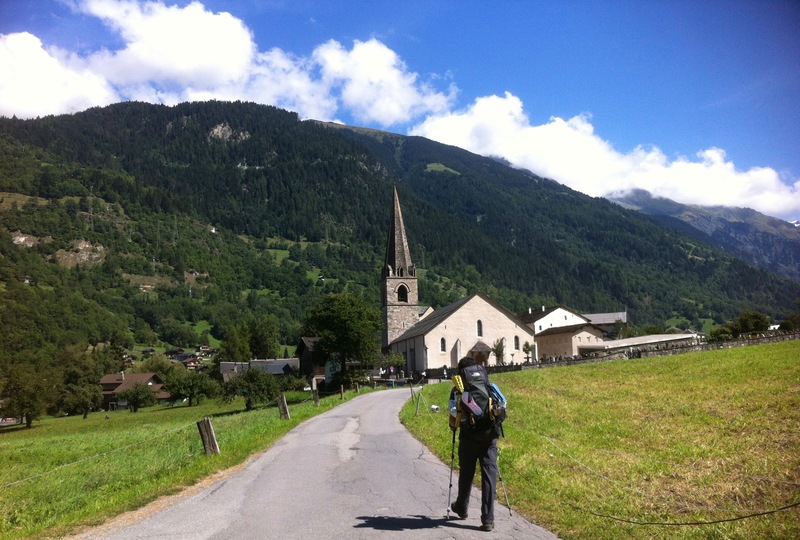 After buying some necessary hiking items such as water and gas for the Jetboil boiler, we started the 1st part of the Haute Route walking along the river and continued up to the The Petit Balcon Nord. The path was different from the one in our guidebook, but recommended by the guy at the Maison de la Montagne. 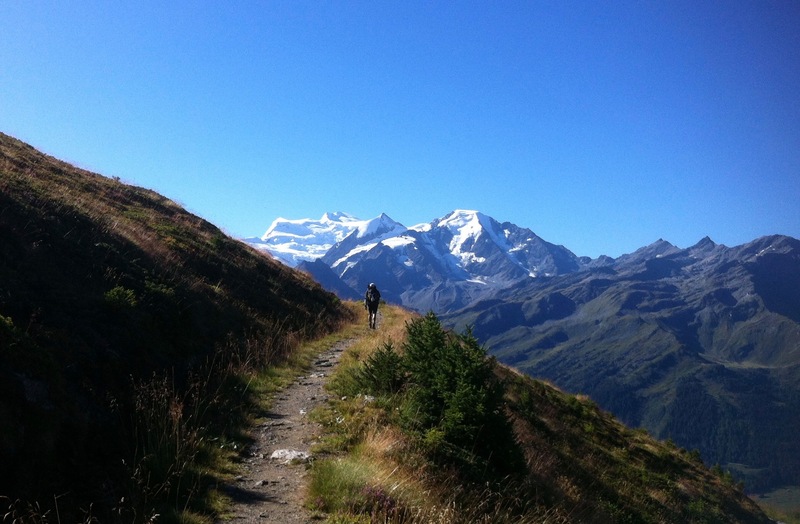 After coming out in the pasture, we could clearly see the Mont Blanc mountain range behind us and could not help but turning our head back again and again to get another glimpse of the majestic scenery. While walking up just a little in the forest, however, both of us started (already!) suffering from our heavy backpacks. This made us seriously worried about what was still to come. We have to hike up und down 1000m in a day in average. Can we really do this, for the next 2 weeks?? 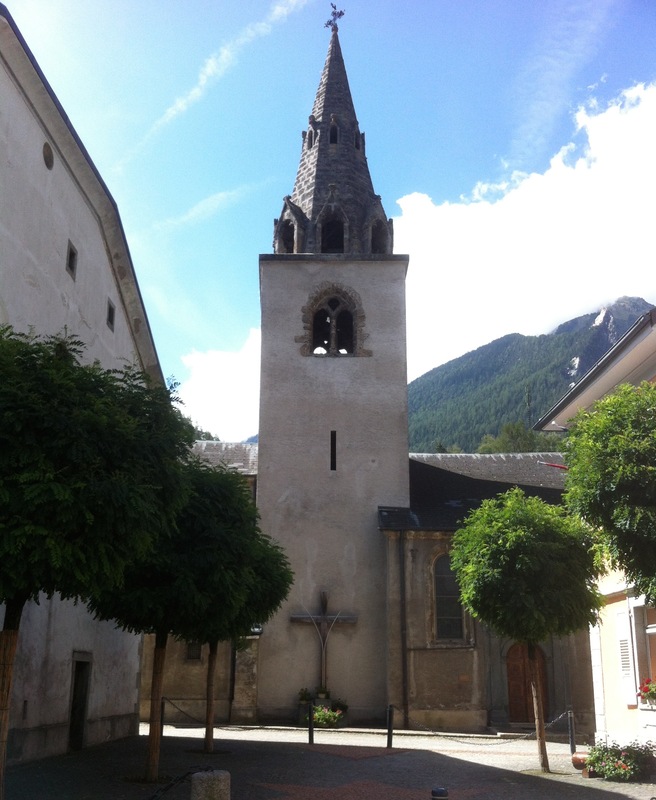 Passing beautiful French villages and cute farm houses, we arrived at the town of Argentière. It is a relatively large village, snugly settled in the valley. People were out there in the square having dinner and it was a pleasant atmosphere.